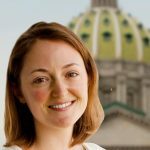 Medicaid in the middle in Pa.
Gov. Tom Corbett and Gov.-elect Tom Wolf are doing a bit of interregnum sparring over changes to the state’s Medicaid program providing health care for low-income Pennsylvanians. There’s a simple question at the center of their disagreement: Should the guy in charge push his policies, or defer to the new guy’s preferences? Wolf favors full Medicaid expansion, authorized by the federal health care overhaul and designed to open up federally covered health insurance benefits to Pennsylvanians whose income is 138 percent of the federal poverty level. The Corbett administration is charging ahead with its alternative to full Medicaid expansion, known as Healthy PA.
Wolf’s team has called for the Corbett administration to do an about-face and begin implementing a full expansion. “What we’re concerned about is that Corbett administration is not moving in that direction,” said Katie McGinty, Wolf’s chief of staff. But Department of Human Services Secretary Bev Mackereth said the only way to ensure coverage begins for 600,000 additional Pennsylvanians is to go ahead with Healthy PA.
Policy experts consider the plan to largely resemble a Medicaid expansion but for a few details that won’t take effect immediately. One controversial piece of the Healthy PA plan would set premiums for enrollees, but the payments wouldn’t kick in until 2016. Cuts to benefits for Medicaid recipients haven’t received federal approval. But McGinty criticized Healthy PA’s structure, which has been called cumbersome and overly bureaucratic. Mackereth did not confirm the figure, but she defended advertising Healthy PA.
Joan Alker, executive director of the Georgetown University Center for Children and Families, said Medicaid enrollees could hope for a “smoother launch” if the Corbett and Wolf teams were being more “cooperative.” But, she added, “it won’t be hard” for Wolf to work with federal officials for a full Medicaid expansion after taking office.